1. Proper name of a man (Ezra viii. 16). The name is recognizable in the name of the Gadite clan Areli (Gen. xlvi. 16; Num. xxvi. 17, Ariel in LXX. ), and occurs also in II Sam. xxiii. 20, R. V., and in I Chron. xi. 22, R. V. The text is corrupt. LXX. in Samuel has "two sons of Ariel"; Targ. "two mighty men." Proposed emendations are: "two lions (or, lion whelps)" or "two sons of Uriel." The reference may be to persons or to beasts. Form and meaning are uncertain. Suggested interpretations are: "lion of God," or, by change of vowel, "light of God," or "God is my light." 2.Poetic name for Jerusalem (Isa. xxix. 1, 2, 7), variously explained (Targ. "altar"). The illustration in verse 2 ("Ariel . . . shall be unto me as Ariel," the city shall reek with blood, like an altar) suggests that the second "Ariel" equals "altar" or "altar hearth"; so probably in Ezek. xliii. 15, 16, and in the inscription of Mesha, line 12. For a proposed sense, "cresset" or "candelabrum," see note on Ezek. xl. 49 in "Sacred Books of the O. T." (ed. Haupt). The etymology of the word is uncertain, possibly , "hearth," with ל formative. The name of the city will then be an imitation of the name "Jerusalem" (perhaps properly Urushalem, "city of Shalem"), "city of God" (Uriel or Uruel). It is otherwise interpreted as "altar-hearth of God"; that is, the place devoted to the worship of God. 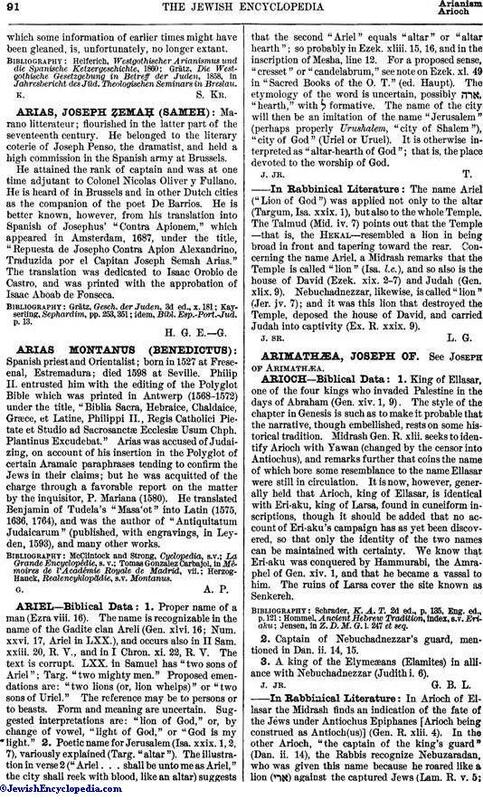 The name Ariel ("Lion of God") was applied not only to the altar (Targum, Isa. xxix. 1), but also to the whole Temple. The Talmud (Mid. iv. 7) points out that the Temple—that is, the Hekal—resembled a lion in being broad in front and tapering toward the rear. Concerning the name Ariel, a Midrash remarks that the Temple is called "lion" (Isa. l.c. ), and so also is the house of David (Ezek. xix. 2-7) and Judah (Gen. xlix. 9). Nebuchadnezzar, likewise, is called "lion" (Jer. iv. 7); and it was this lion that destroyed the Temple, deposed the house of David, and carried Judah into captivity (Ex. R. xxix. 9).